Farm Mapping Services is a specialist provider of accurate and detailed property maps produced using the latest aerial photos. The company has now expanded its services to include links to Fairport farm management software programs. Farm Mapping Services’ maps of properties incorporate a range of layers from essentials such as paddock areas to useful items such as location of underground services, and are presented in a variety of formats including the popular PDF versions for computer viewing, A4 paper maps, map booklets and large format magnetic whiteboards that include the farm map and tables for rosters. Maps are produced using the latest aerial photos that are further worked on to allow distances to be measured, following which the property is drawn accurately over the top of the photo. Maps can indicate chemical storage sites and other safety information, fertiliser use, and paddock rotations for individual herds or mobs. According to Peter Harrisson, principal of FMS, the business is always looking for excellent systems that will assist property owners to enhance their farm management. 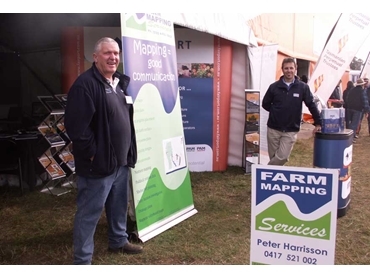 The PAM program and its associated GP Mapper module from Fairport meet Farm Mapping Services’ specific needs. FMS maps can be easily imported into Fairport's farm management software programs, allowing cropping activities, livestock movements, pasture activities and other farm practices to be entered into the program and linked to the map, enabling owners to analyse productivity paddock by paddock. Paul Drendel, the Fairport distributor for Victoria will be at the Sungold Field Days to be held at Warrnambool from 15th to 17th February to explain the advantages and attributes of the programs.